At the Fourpenny Workshop, we've finished the year with some lovely projects. Three new-build Shepherd's Huts have been carefully crafted at the Fourpenny HQ using traditional designs, traditional techniques and traditional materials - all finished with the Fourpenny Workshop's meticulous care and attention. The inside of the Shepherd's huts feature beautifully curved wooden ceilings, panelled walls and traditionally styled beds and furniture. ...a job requiring a very large lorry! We've also produced this robust 'Rolling Chassis' for a customer who is keen to build his own hut. We're looking forward to seeing the completed project! We were pleased to see that the garden workshop we built earlier in the year is bedding in nicely. 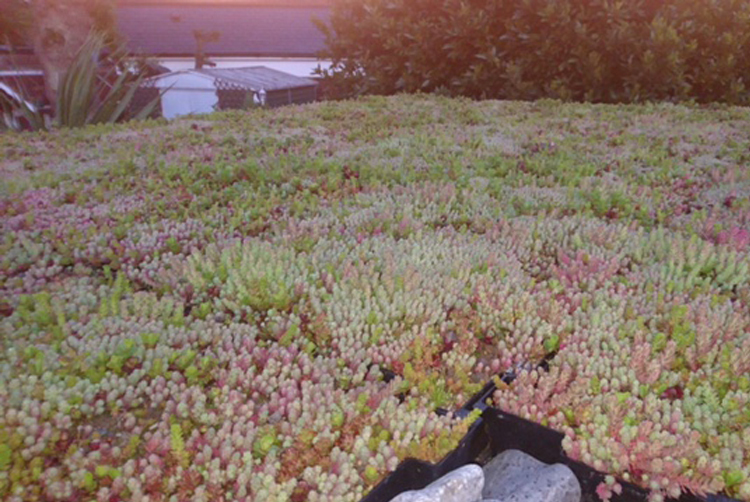 The fabulous sedum roof on this timber building has grown nicely and is looking great. We've worked on a couple of great retail projects this year too. At Pete Atkinson's Anyfish shop we wanted to match the front of the shop with the rustic wooden interior we'd created. We collaborated with our friends at Big Stuff (who helped produce the stainless steel lettering) and built a shop sign from carefully selected timber and bolts. It's fair to say that both Pete and the Fourpenny Workshop team are very pleased with the results! That wasn't the only shop project - we also worked on the interior of the very tasty Sweet Corner on Bishop's Waltham High Street. Reclaimed oak and Fourpenny experience added up to a very smart new look. Next year we intend to kick things off by catching up with some of our Shepherd's Hut restoration work - so watch this space for more project reports! If you'd like your own newbuild Shepherd's Hut, have a reclaimed Shepherd's Hut to restore or if you'd like a timber structure to bring a little Fourpenny character to your house or garden, why not give us a call?